Manual application of IPAM GPOs: With this method, IPAM GPOs are created but are not automatically applied to managed servers. Application of GPOs is done manually by adding managed servers to GPO security filtering. To use this method, first perform the steps in Create IPAM Provisioning GPOs. When you have created these GPOS, configure security filtering by performing the steps in Configuring IPAM GPO security filtering. Manual configuration of individual settings: GPOs are not used with this method. Instead, access settings on each managed server are configured manually by an administrator. Steps to configure these access settings are provided in this topic. For more information about choosing an IPAM provisioning method, see Choosing a provisioning method. Membership in the Domain Admins group, or equivalent, is the minimum required to complete this procedure. Review details about using the appropriate accounts and group memberships at Local and Domain Default Groups (http://go.microsoft.com/fwlink/?LinkId=83477). A summary of required settings is provided in the table below. Use the following procedure to enable access by the IPAM server to inbound firewall ports on a managed DHCP server. If the managed DHCP server becomes unmanaged, delete these inbound firewall rules. All of the following procedures are performed on the managed DHCP server. On the Server Manager menu, click Tools and then click Windows Firewall with Advanced Security. In Rule Type, select Predefined, choose DHCP Server Management from the list, and then click Next. Click Next, choose Allow the connection, and then click Finish. In Rule Type, select Predefined, choose File and Printer Sharing from the list, and then click Next. In Rule Type, select Predefined, choose Remote Event Log Management from the list, and then click Next. In Rule Type, select Predefined, choose Remote Service Management from the list, and then click Next. To access configuration data and server event logs, the IPAM server must be a member of the domain IPAM Users Group (IPAMUG). The IPAM server must also be a member of the local DHCP Users and Event Log Readers security groups. It is necessary to restart the DHCP service after changing security group memberships in order for these changes to become active. After performing these procedures, refresh the server access status for the managed DHCP server in the server inventory view on the IPAM server. On a domain controller, click Tools on the Server Manager menu, and then click Active Directory Users and Computers. In the Active Directory Users and Computers console tree, right-click the Users container under the managed DHCP server’s domain, point to New, and then click Group. In the New Object – Group dialog box, under Group name, type IPAMUG. Under Group scope, select Universal and under Group type select Security, and then click OK.
Double-click the IPAMUG group and then click the Members tab. Click Object Types, select the Computers checkbox, and then click OK. Under Enter the object names to select, type the name of the IPAM server and then click OK.
Verify that the correct IPAM server is displayed under Name and then click OK.
On the managed DHCP server, click Tools on the Server Manager menu and then click Computer Management. In the Computer Management navigation tree, click Local Users and Groups and then click Groups. In the list of groups, double-click DHCP Users and then click Add. Under Enter the object names to select, type IPAMUG and then click OK.
Verify that <domain>\IPAMUG is displayed under Members and then click OK. In the list of groups, double-click Event Log Readers and then click Add. Leave the Computer Management console open for the following procedure. To audit IP address utilization, IPAM requires access to the DHCP database file located in the windows\system32\dhcp directory. The following procedure provides access to the DHCP database by creating a network share. In the Computer Management navigation tree, click Shared Folders and then click Shares. Right-click Shares and then click New Share. In the Create A Shared Folder Wizard, click Next. Next to Folder Path, type the absolute path to the DHCP audit file location and then click Next. By default this is the %windir%\system32\dhcp directory, for example C:\windows\system32\dhcp. Next to Share name, type dhcpaudit and then click Next. Under Set the kind of permissions you want for the shared folder, choose Customize permissions and then click Custom. In the Customize Permissions dialog box, click Everyone, click Remove, and then click Add. 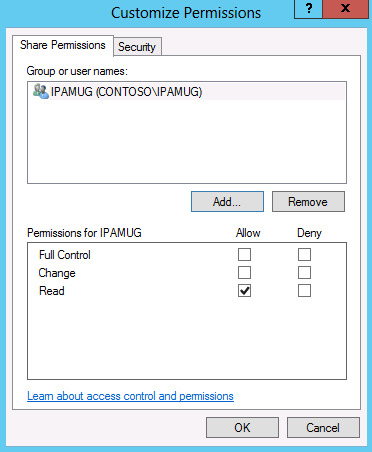 Verify that IPAMUG is displayed under Group or user names, and that Read is allowed under Permissions for IPAMUG, click OK, and then click Finish twice. If the DHCP logs are stored in a different folder than %windir%\system32\dhcp, you must modify step 4 in the previous procedure to use this location. For example, clustered DHCP can define a unique DHCPAUDIT location for these files. The folder that must be shared is the folder that contains DhcpSrv*.txt files that are generated by the DHCP server. The location of the DHCP audit log is defined in the Windows Registry by the value of the registry key: HKEY_LOCAL_MACHINE\SYSTEM\CurrentControlSet\Services\DHCPServer\Parameters\DhcpLogFilePath. To activate new security group memberships on the DHCP server, you must restart the DHCP Server service. In the Server Manager navigation pane, click DHCP. Under SERVICES, right-click the name of the managed DHCP server, and then click Restart Services. To monitor status of the DHCP service, click the Server Manager notification flag. Verify that the service stops and starts successfully.